Luxury all the way! Huge master suite, 4 Slides, fireplace, residential refrigerator, exceptional floor plan! America's #1 selling trailer for the past 10 years. Slide Model. Loaded and ready for fun! 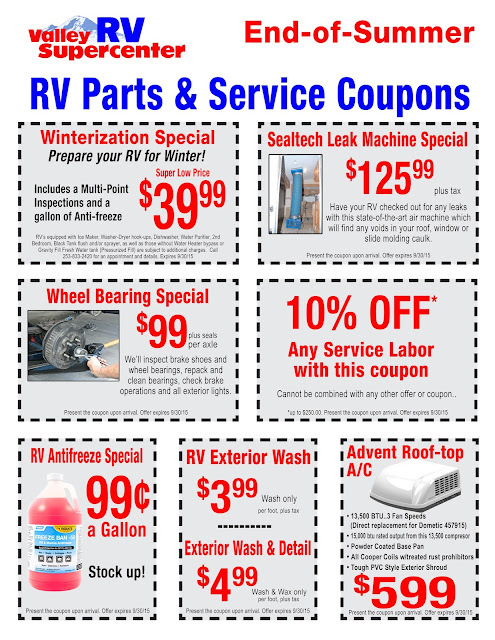 End-of-Summer RV Service & Parts SPECIALS! new monthly issue of Northwest RVer? If not, just click here. It takes about 10 seconds to sign up. It's been beautiful here in the Northwest in recent weeks, and one place where you really see the effect is in the Skagit Valley, where this year's batch of tulips is about to burst into full bloom. If you have never witnessed this incredible display of Mother Nature's color, you are missing out. 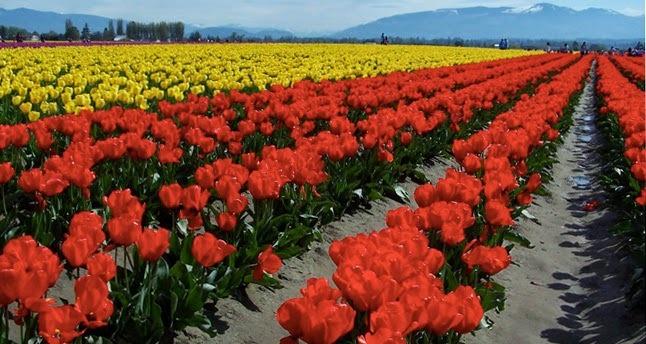 The annual Tulip Festival runs from April 1-30, when the flowers are typically in full bloom. But this year, with all the good weather, festival promoters are expecting the flowers to appear about a week early, which would mean around March 23. So you might want to head up then to beat the crowds. You won't find such gorgeous tulips anywhere else unless you want to hop a plane to Holland. The two-lane country roads that crisscross the tulip fields are not welcoming to RVs during the festival due to heavy traffic, so it's best to visit with a car or your tow vehicle. Three very nice nearby places to camp are at Bay View State Park along Padilla Bay and at the beautiful Thousand Trails Preserve in La Conner. Washington Park in Anacortes, with its waterfront and forest campsites, is another beautiful spot perfect for a weekend getaway or longer. One tell-tale sign of spring here at Valley RV Supercenter is the interest in travel trailers. Families come out of hibernation to check out the 2015 models. 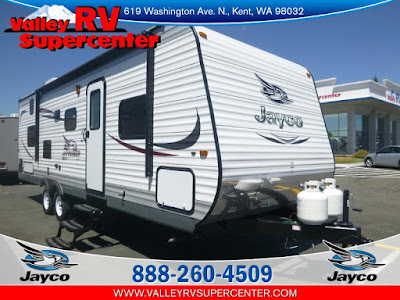 The Jayco Jay Flight has been the best-selling travel trailer in America for the last ten years and we have an excellent selection. There's a reason these trailers are best-sellers year after year. To learn why, click here. And if you like what you see, stop by Valley RV Supercenter to check out the many units we have on display. Visit here beforehand to see our inventory and our Internet Specials. With that, I'll say goodbye for now. Hope to see you here again next month. When done with your fresh water hose, coil it up and screw the ends together tightly to keep out bugs and dirt while it is stored. Flush it thoroughly before use. If you're an active member of the U.S. military, then pay attention. The Escapees RV Club will provide you with a free membership as long as you are in the service. There are no strings attached. Learn more here. Do not assume that a public campground where you are headed has a dump station based on what you read in a directory or other literature. Sometimes you will find it has been closed for repairs or even for good. If you show up with full holding tanks, expecting to dump on arrival, you have a problem. It's always a good idea to seek out a location to dump before you arrive ... just in case. When boondocking, carry a few gallon jugs of drinking water with you. Use them in the kitchen for cooking, filling the coffee pot, refilling drinking bottles. This leaves more water in the fresh water tank for washing, flushing and other chores. 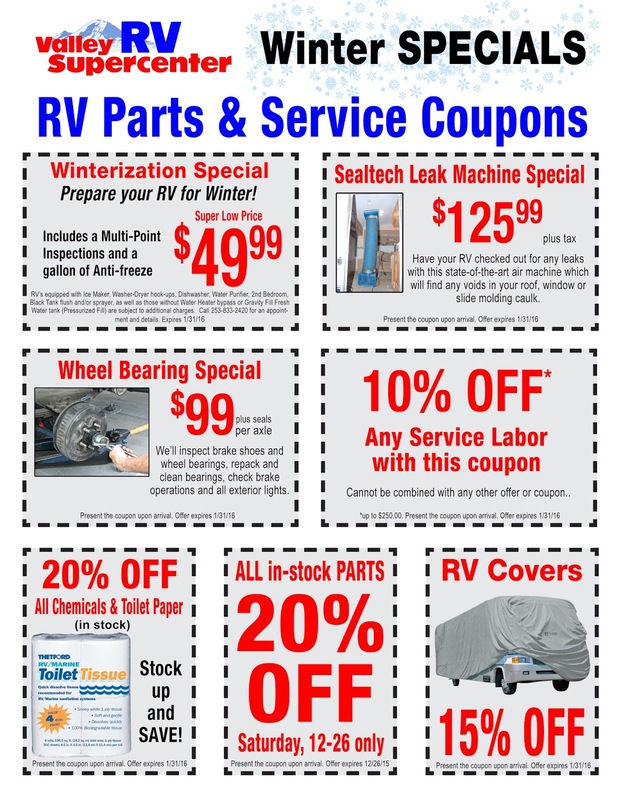 Here are some great deals on some great RVs. Just click the graphic! Jayco has introduced a new gas Alante Class A offering. Nationally advertised at $79,995 base price for the 31L and 31V models, the Alante Class A motorhome will initially be available in four floor plans. Watch for it soon at Valley RV Supercenter. Read more. Jayco’s Seismic continues to be a sought-after product at consumer shows across the country. “It’s exciting to see the Jayco Seismic gaining traction and capturing more and more buyers at every show where it is represented,” said Mike Aplin, senior product director for Jayco’s line of toy haulers. “The combination of the right floorplans, décor choices and level of luxury are definitely aiding in its recent popularity.” Jayco currently has four offerings in the toy hauler segment: the Octane Super Lite and Octane, both travel trailers, and the Seismic Wave and Seismic, both fifth wheels. Click here to learn about our job openings. •Lubricates door hinges on vehicles. •Restores roof racks on vehicles. •Keeps rust from forming on saw blades and other tools. •Removes all traces of duct tape. •Removes black scuff marks from a kitchen floor. •Removes love bugs from grills and bumpers. •Lubricates and stops squeaks on electric fans. •If you spray WD-40 on a distributor cap, it will displace moisture and allow the engine to start. •Use WD-40 to help get rid of bugs on your RV or car's paint (if not removed they will eat away the finish). Rumor has it that WD-40's main ingredient is fish oil, but that's not true: it's mostly petroleum-based. Do you know how it got its name? It was in 1953 when scientist Norm Larsen at the San Diego Rocket Chemical Company was attempting to develop a formula to prevent corrosion on missile parts, achieved by displacing water. On his 40th try, he got it right. And so we have WD- ("water displacement") 40. Lost the owner's manual to your Jayco RV? It happens: we misplace the owner's manual for our RVs. Well, good news! If you have a Jayco motorhome or towable, then your rig's owner's manual is a couple of mouse clicks away. The first click is here. Here’s a valuable resource from Motorhome Magazine: annual dinghy towing guides. Download these for free for information about towing a vehicle for model years 2012, 2013 and 2014. Earlier guides are available for $1.99 each for earlier years. If you plan to buy a vehicle to tow behind your RV, be sure you know its towing requirements. In these guides you will learn if it can be towed four wheels down, and if so, if there are any other requirements or restrictions. Get a dinghy guide. Towing a trailer or fifth wheel? If you plan to buy a new trailer or fifth wheel, you’ll want to be sure the vehicle is up to the task. 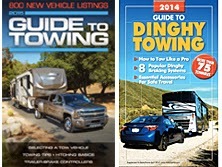 Here’s are free guides from Trailer Life to trucks and other vehicles from model years 1999 to 2015 that are powerful enough to tow your RV. Be sure your tow vehicle is up to the task. If it’s not listed in these guides, be wary. Learn more or download a guide. Valley RV Supercenter tech expert Chris Nelson answers questions from readers. Q: What should I be doing to get my trailer ready for this camping season? After de-winterization and a good exterior cleaning you should pack your wheel bearings, clean and adjust your brakes, clean and adjust your refrigerator and water heater, inspect your furnace, check your LP system for leaks and regulator for proper pressure, flush your water system and check for leaks, visually inspect your roof and seals and re-torque A/C bolts. This will satisfy most manufacturers’ maintenance requirements, as well, and provide you with a great start to this year’s camping season. Q: How often do I need to run my generator on my RV? You need to run your generator a minimum of once a month with a load (A/C and appliances on) for an hour to keep your generator running properly. It's recommended to change the oil and service your generator every 150 hours or once a year. This is a common problem with RVs. You will need to make sure you are filling the tank and flushing it out several times to remove debris from the interior of the tank. If the problem still continues, fill the tank to half full and put several bags of ice down the toilet and allow to slosh around as you drive to your next stop, then fill and flush again. 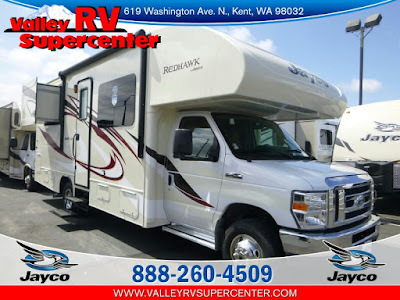 At Valley RV Supercenter we are always looking for quality vehicles. Let us help you sell yours! Just click here then fill out the requested information. One of our buyers will contact you as soon as possible. For questions or assistance, please contact our consignment department at 888-260-4509. Crater Lake National Park has hit a record for the lowest snow level since measurements began in 1931. The official snow depth at park headquarters was 28 inches on February 26 — breaking a low-snow record of 31 inches set back in 1977. Records show that the average snow depth for that date is 110 inches, or more than 9 feet. The national park system in the United States has a new attendance record for 2014. More than 290 million people visited one of the many national parks or recreational areas in the country. The most visited park was Great Smoky Mountains National Park with 10,099,276 visitors. Olympic National Park drew 3,243,872 visitors for sixth place, just ahead of Utah’s Zion National Park. Washington State Parks turns 102 years old on Thursday, March 19, and visitors are invited to help celebrate by visiting their favorite state park for free that day. Mark your calendars for the upcoming Puyallup RV Show, coming April 30 to May 3 at the Washington State Fair Events Center (Puyallup Fairgrounds). There will be hundreds of RVs to explore, plus seminars by RVing experts. Valley RV Supercenter will be on hand. So be sure to stop by and check out our display of 2015 Jayco RVs. Learn more at the RV show's website. The 2015 Jayco White Hawk doesn't skimp on space, meaning families won't have to skimp on amenities. Thanks to 36-inch-deep slideouts, Jayco went heavy on fun in this lightweight travel trailer. Check it out. Oregon’s Ainsworth State Park on the Columbia Gorge will open for the 2015 camping season on March 13. The park has approximately 40 full-hookup sites canopied in a laid-back, tree-filled setting. Learn more or make a reservation. Buy from Valley RV Supercenter and you will save $$$! 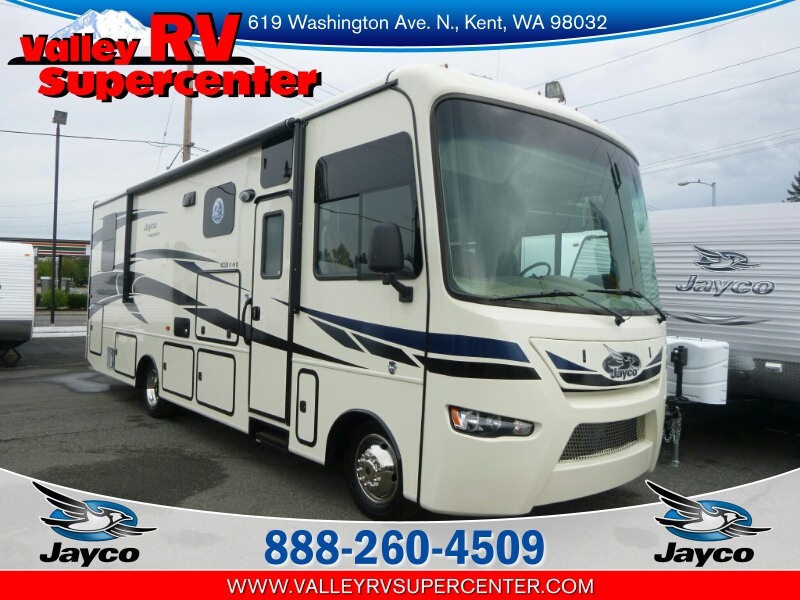 Being a Jayco dealer in the Pacific Northwest, Valley RV Supercenter is positioned to offer an opportunity for our friends across the border to save money on their RV purchase. How? Click here to find out. Membership in Jayco Travel Club is open to owners of all RV brands manufactured by Jayco Mfg. Inc. Chapters located throughout the U.S. and hoping to expand into Canada. The best club for full-time or extended-time RVers. Outstanding club magazine. Holds regional and national rallies. 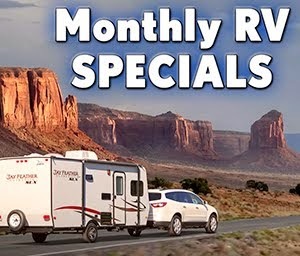 Owns club RV parks across the USA where members can stay at bargain prices. Good mail forwarding service for full-timers. Celebrating its 35th birthday! Welcome to the first edition of our new newsletter, published in conjunction with NorthwestRVer.com. Once a month we'll bring you news and information about RVing in our beautiful Northwest. We'll tell you about great places to visit, and we'll pass along tips about using your RV and maintaining it. 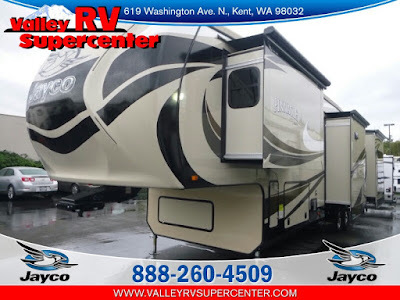 As you probably know, Valley RV Supercenter is the Northwest's #1 Jayco dealer. So we'll keep you up-to-date on all the company's products. We'll show you video walk-thrus and introduce you to new models. We'll provide tips about caring for your Jayco as well as point out any accessories that are of particular interest. 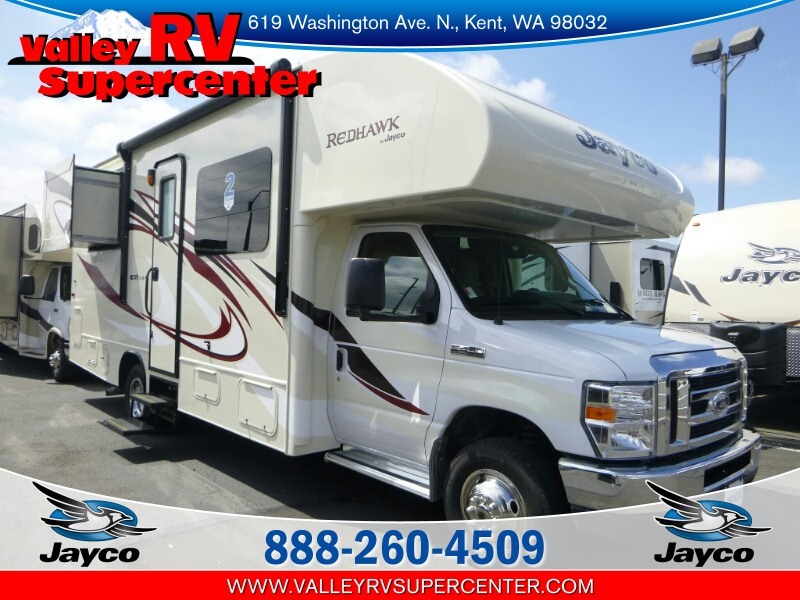 We always have a large selection of pre-owned RVs from other companies as well as Jayco. You'll find these RVs on our website. We'll keep you posted on new arrivals through this monthly newsletter. The largest indoor RV show in the West gets underway this Thursday, Feb. 5 and runs through Sunday the 8th in downtown Seattle at the CenturyLink Field Event Center. This is a great opportunity to see a lot of RVs in one place and get a great deal on the one you conclude is best for you. If you plan to attend, be sure to use the coupon code below for two admissions for the price of one admission coupon below which also includes free parking at the Safeco Field Parking Garage ($13 value). You'll also receive a complimentary cup of chowder at FX McRory's! The 2015 show features an impressive lineup of seminars, plus free babysitting on the weekend for the kids. Celebrate German sausage at this 7th annual event. Area sausage makers will offer up their best bratwurst, currywurst, frickadelwurst and other wursts garnished with sauerkraut, grilled onions and Monastery Mustards. Enjoy world famous Warsteiner beers from Germany and local favorite Seven Brides Brewing. On Friday, celebrate a raucous Fasching (German Mardi Gras) with prizes for the best costume. Learn more. Here’s a fun, family festival for chocolate lovers! There are chocolate vendors, artists and crafters. Attend a cooking class or enter your favorite recipe in the recipe contest. How about entering an eating contest? Attendees will find chocolate that is gluten free, dairy free, vegan, organic, fair trade, raw and even healthy treats for your favorite furry friends. Yum! Read more. A few things to think about when choosing a campsite near or beneath trees: First, do not camp close enough to branches that they may sway in a sudden wind: that can annoy you, or worse, scratch your RV's paint. Second, check the area around the tree before selecting a site for anything that may be dropping from a tree — berries, leaves. . .even bird droppings from a favorite roosting place. And if a big storm is brewing, it may be best to stay away from trees that could come crashing down. Prepare more complicated meals when you have full hookups. It's easy to clean up afterwards because you have plenty of water and no worry about filling up holding tanks. Consider making a double portion and freeze half for a future meal. When boondocking, keep recipes simple; use paper plates which you can burn later to start your campfire. Take an occasional peek between your dual tires to make sure nothing has wedged in there. 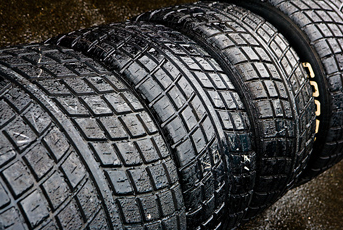 If it seems like something has been there a while, it might be best to have a tire shop inspect for damage. Always know the name and location of your campground including your site number (and gps coordinates if possible). If it's a public campground with no street address, then know which highway it's along and the direction of the closest city. In an emergency you may have to call for help. If you don't know where you are, you could have a serious problem. The Washington State Parks 2015 wall calendar is now available for purchase! The calendar features brilliant color photos that represent some of the park system’s premier and unique features. Visit the Park Store web page to order. Looking for a lightweight trailer? Perfectly sized for on-the-go fun, the Jay Flight SLX packs everything you need in a lightweight RV design. Starting with its 8 feet 8 inches height, select SLX models fit into most residential garages, and built at 7 feet wide, this minivan-friendly, crossover-capable design is easy to see around when being pulled. Learn more at Jayco.com. Or at Valley RV Supercenter. Jay Flight for 2015 now even offers Murphy Bed floorplans. Whether you are looking for a bunk room for the kids, a rear kitchen layout, or an outside kitchen, you're sure to find the 2015 Jay Flight that is just right for you and your family at the right price. Read more. The 2015 Jay Flight SLX offers a variety of versatile floorplans at a family-friendly price, including the all-new eight-foot-wide models. Whether you're looking for bunks or a queen bed, Jay Flight SLX has the perfect fit for you. And with a full featured kitchen and bathroom, the SLX delivers all of the essentials. Read more. 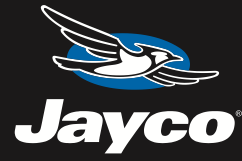 Jayco adding to its plant to meet demand! What do you do when you produce a great RV and you run out of room to make it? You add more manufacturing space! That’s what Jayco is doing — building a new plant on its sprawling Middlebury, Ind., campus. The new facility will be dedicated to the manufacture of Jayco’s high-end Entegra Coach Class A’s, including the Aspire, Anthem and flagship Cornerstone brands, according to Jayco Motorhome Group President Tadd Jenkins. Read more. Do it yourselfers, gadget lovers and anybody looking to upgrade their RV won’t want to miss this year’s “Ask the Technician” exhibit at the 2015 Seattle RV Show. At the exhibit you will find a fully accessorized travel trailer and tow vehicle equipped with the latest toys and upgrades. 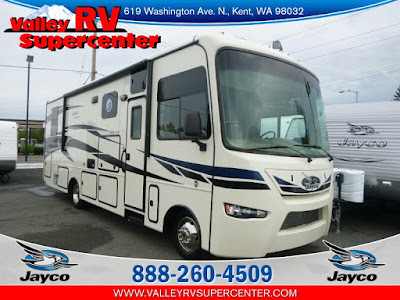 Chris Nelson of Valley RV Supercenter will be on hand to answer your questions concerning general RV service, jacks, awnings, antennas and other installed accessories. Click here to learn about the products to be featured at this exhibit. Lost the owners manual to your Jayco RV? It happens: we misplace the owners manual for our RVs. Well, good news! If you have a Jayco motorhome or towable, then your rig's owners manual is a couple of mouse clicks away. The first click is here. Become a host in a Washington State Park! How about spending a month or longer at a beautiful Washington State Park, rent free? If that sounds good, consider becoming a camp host. The Host Program offers enthusiastic and interested volunteers the chance to stay and have fun in beautiful and diverse park settings while gaining experience in park operations and visitor services. 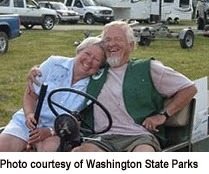 Hosts are needed year-round in most Washington state parks. As a host, you will greet the public and help set the tone for a pleasant stay. Hosts assist park staff and perform a variety of tasks depending on the park and the type of host assignment. They receive free camping and hookups in exchange for performing these duties. A typical host assignment is 30 days. This may be extended up to 90 days at the park manager's discretion. Hosts must provide their own RV and camping equipment. Hosts should enjoy working with the public, have the desire to accept new challenges, and possess the willingness to learn about Washington state parks. Learn more. Prefer to be a camphost in Oregon? Click here for information. •Washington State Parks announces free admission days for 2015. •Entrepreneur's idea for tram to Hurricane Ridge would face huge federal, state hurdles. •The quietest place in America is one square inch in Olympic National Park. •This Washington State Park is a gem! •Washington State Park leaders optimistic about 2015 funding boost. •Best Oregon State Parks for winter camping. •Oregon’s White River Falls shows frosty formations when temperatures dip in winter. •Crater Lake, Oregon’s blue beauty, faces unclear future. •Camping fees at most BC provincial parks will cost $2 more beginning March 15. Some will rise $5. Make plans for 2015 National Park free admission days. Make reservations now for best Northwest summer camping spots. Looking for a great "staycation" — a nearby spot to camp and enjoy yourself? Cape Disappointment State Park on the Long Beach Peninsula has 137 standard campsites, 60 full hookup sites, and 18 sites with water and electricity only. The park offers two miles of ocean beach, two lighthouses, an interpretive center and hiking trails. The park store offers gifts, ice, wood, fishing gear and other camper essentials. Take a video tour! County Line Park, Cathlamet, Wash. Mom and Dad at Seattle RV Show! There's a lot going on at this week's Seattle RV Show besides a whole buncha RVs to check out! For kids, there's a treasure hunt with hidden booty! Children 12 and under can obtain a treasure map and a booty bag at any show entrance then follow the map to six hidden treasure chests throughout the show. Who knows what treasure awaits?